Tired of getting the same average mark in exams while all your friends make it to the top? Well, it’s every student’s desire to score good marks in exams and be at the top. Although its every students desire, only a few make it to the top while the others are still at an average level. 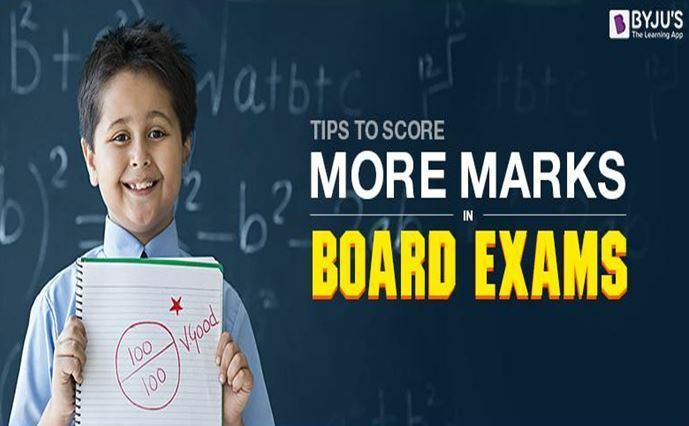 Here we provide some tips and tricks to help score more marks in the board exams. Although listening to the lecture may seem boring and irritating, this is the easiest way to score more marks in exams. Understanding the topics taught in class can help you to cover 75% of your preparation for that concept. Once you have a clear understanding of the concept for example like a concept on magnetic waves, it is important to practice or revise the concept at home which will inturn allow doubts to occur, so that you can clear it with the teacher the next day. Having this practice on a frequent basis will help you to have a thorough understanding of all the concepts, resulting to score well in exams. Every students in unique. Hence, understanding your personal learning style is what is important for you. Some students prefer learning through videos, audios, animations, textbooks, etc. Understanding that specific style of learning which suits you the best will help to speed up your preparation, allowing to you cover more concepts and to score more in board exams. Working hard is good but it is always better to work smart as it helps you to save time and to be more efficient. Using mnemonics in your exam will help you to remember complicated concepts without any hassle. It is also important that the mnemonics used is properly remembered to avoid getting mixed up during your examination. Hence, here we have seen some of the few tips and tricks to score more marks in board exams that will help you to come out of being average and to enter excellence. For more tips and tricks to learn complex topics like electromagnetism, Newton’s Laws, subscribe to our BYJU’S YouTube Channel.